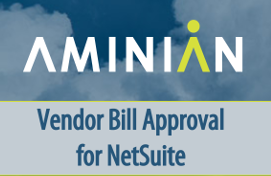 Aminian’s Vendor Bill Approval SuiteApp saves time and preserves valuable resources by allowing department heads, or other permitted employees, to approve or reject Vendor Bills without having to access your NetSuite account. Permitted personnel can approve or reject vendor bills via a custom Suitelet. Users can enter reasons for rejection and other notes that will be saved on the Vendor Bill record in your NetSuite account. This provides increased efficiency, prevents miscommunication with vendors, and protects against data entry errors in your NetSuite account. Ideal for all industries, our Vendor Bill ApprovalSuiteApp increases productivity by optimizing time-consuiming AP tasks into a single, end-to-end application that simplifies the bill approval processes. bill approval process inside NetSuite. Our Vendor Bill Approval SuiteApp provides Finance teams with the ability to request approval from non-NetSuite users via an automated email. Approving personnel do not require a NetSuite User License to approve vendor bills with the Vendor Bill Approval SuiteApp. Permitted personnel can approve or reject vendor bills via a custom Suitelet. Users can enter reasons for rejection and other notes that will be saved on the Vendor Bill record in your NetSuite account. Aminian’s Vendor Bill Approval SuiteApp automatically notifies AP and Finance personnel of vendor bills that have been approved/rejected for payment via email. All Vendor Bill approval and rejection history is stored on the Vendor Bill record for tracking and future reporting purposes.